Just six months after the launch of the Honor 7C, the Chinese smartphone company is set to launch its successor, the Honor 8C. This new smartphone is powered by the Qualcomm Snapdragon 632 processor and features AI-enhanced cameras, a notched display, and Android 8.1 Oreo out of the box. 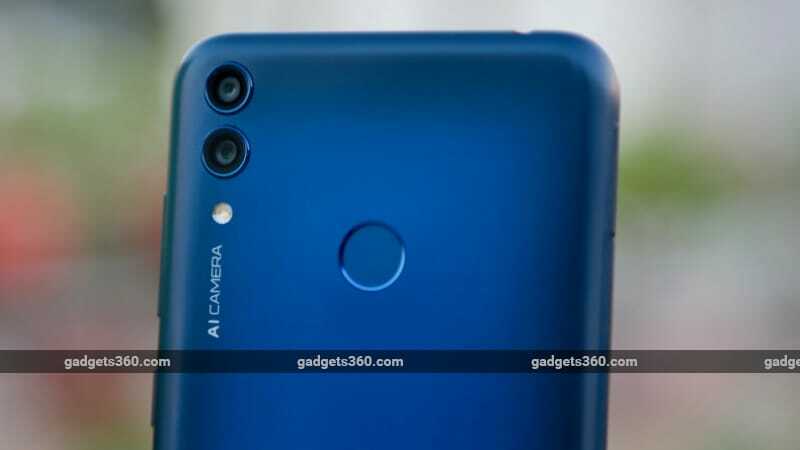 The Honor 8C is expected to be launched in two variants, one with 4GB of RAM and 32GB of storage, and the other with 4GB of RAM and 64GB of storage. We got to spend some time with the latter variant of the Honor 8C before its official launch – scheduled for November 29 – and here are our first impressions. The front of the Honor 8C is dominated by a 6.26-inch HD+ display. The notch is quite small and can be masked thanks to an option in the settings. The area around the notch is used to display the time, battery level, and other status icons. First-party applications are built to accommodate the notch. In our brief time with the Honor 8C, the display seemed to have adequate brightness, good viewing angles, and punchy colours. However, text and images were not very sharp thanks to the HD+ resolution which is a bit lacklustre for a screen this size. Users can choose from on-screen buttons or EMUI’s gestures, which we found to be unreliable at times. The body of the Honor 8C is all plastic and the phone is a bit too wide and tall to be used comfortably with one hand. The smartphone feels solid but doesn’t look as premium as some of the other models in the Rs. 10,000 to Rs. 15,000 price level. The glossy plastic back attracts a ton of fingerprints and makes the phone very slippery. Honor has tried to replicate the color gradient used on its pricier glass-backed offerings, but hasn’t succeeded fully. The black and blue gradient on the back of our review unit looked a little garish to us. The left of the smartphone is blank save for the SIM tray, which has two Nano-SIM slots and a dedicated microSD card slot. The right side has the lock/ power button and the volume rocker, which are small but tactile. The single loudspeaker can be found at the bottom, along with a Micro-USB port and the primary microphone. The secondary microphone and 3.5mm headphone jack are placed on the top. The lack of a USB Type-C port in this day and age is rather disappointing. We were pleased with the accuracy and speed of the rear-mounted fingerprint sensor, and face recognition was also quite snappy. Of course, a detailed assessment of these features will have to wait till the full review. The Honor 8C is powered by the octa-core Qualcomm Snapdragon 632 SoC with its integrated Adreno 506 GPU, paired with 4GB of RAM. In our limited experience, the smartphone tackled day-to-day tasks quite well but struggled a bit with intensive use. Games such as Asphalt 9 and PUBG were playable but only after reducing the graphics settings. A definitive assessment of the performance will have to wait till our full review, when we can push the smartphone further and run synthetic benchmarks. The Honor 8C runs Honor’s EMUI 8.2 custom skin atop Android 8.1 Oreo. EMUI is is quite fast and fluid but feels cluttered and has plenty of bloatware. The phone uses Chrome and Android’s default messaging app but the Dialer, File Manager, and Gallery are Honor’s own. Facebook, Messenger, Netflix, and Camera 360 come pre-installed, along with a bunch of first-party apps from Huawei such as HiCare, Huawei Health, Themes, Honor Store, and Honor Club.